Setup Area: 15' Width x 8' Diameter x 12' Height...plus room to throw!! 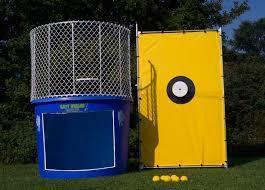 Dunk tank holds 500 gallons of water and takes 1 hour to 1 1/2 hours to fill completely. Water and water hose provided by rental customer.